A Standoff is a fastener that is used to create space between two objects, often to properly position them. In the world of electronic components and electronic hardware, standoffs are typically used to space circuit boards, panels, doors or gears. Standoffs can be round, hexagonal or square in shape. They can have exterior knurling as well as swage characteristics. 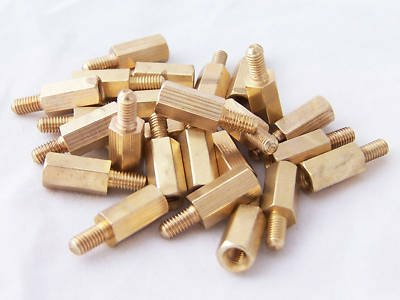 Female-Female or Double Female Standoffs can be fully threaded or partially threaded on each end. Male-Female Standoffs are also available. 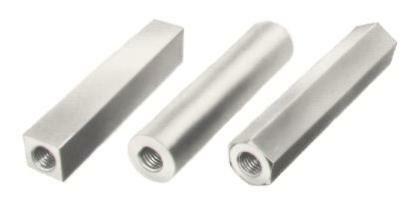 Standoffs are available in a variety of materials including aluminum, brass, plastic, steel and stainless steel. A Female-Female Standoff is a fastener that is used to create space between two objects, often to properly position them. In the world of electronic components and electronic hardware, standoffs are typically used to space circuit boards, panels, doors or gears. Female-Female Standoffs can be round, hexagonal or square in shape. They can have exterior knurling as well as swage characteristics. Female-Female or Double Female Standoffs can be fully threaded or partially threaded on each end. F-F Standoffs are available in a variety of materials including aluminum, brass, plastic, steel and stainless steel. Unthreaded female standoffs can be found in our Spacers section. A Male-Female Standoff is a fastener that is used to create space between two objects, often to properly position them. In the world of electronic components and electronic hardware, standoffs are typically used to space circuit boards, panels, doors or gears. Male-Female Standoffs can be round or hexagonal in shape. They can have exterior knurling as well as swage characteristics. Male-Female Standoffs have internal threads on one end and male threads on the other. M-F Standoffs are available in a variety of materials including aluminum, brass, plastic, steel and stainless steel. A Male-Male Standoff is a fastener that is used to create space between two objects, often to properly position them. In the world of electronic components and electronic hardware, standoffs are typically used to space circuit boards, panels, doors or gears. Male-Male or Double Male Standoffs have a hexagonal center section and are characterized by external threading on both ends. M-M Standoffs are available in a variety of materials including aluminum, brass, plastic, steel and stainless steel.